The new year 2011 has just started and it looks very, very promising for Marble: According to the Release Schedule "KDE Software Compilation (SC) 4.6" will get released with Marble 1.0 in about two weeks. This will be an exciting release which will introduce largely extended worldwide Routing support (Online and Offline), Bookmarks, QML bindings for libMarble, official support for the Nokia N900 / Maemo platform and too many other things to mention! With our usual release cycle the next big milestone would be Marble 1.2 which will be released together with KDE SC 4.7 (Summer 2011). We have hopes that this might introduce the first steps towards an OpenGL mode for Marble and lots of other bigger framework changes. A Social Contacts plugin which uses OpenDesktop.org to display your friends on the Marble globe. And a Map Creation Wizard that allows you to create your own maps (e.g. using ready made images, a WMS Server or a Server Url) and prepares them for upload and contribution to the Marble map servers. Really cool stuff! Read all about it in Utku's blog! And lots of other improvements that make Marble an even more polished jewel. See Daniel Marth's wiki page for all the exciting details! And then there have been lots of other changes by students like Cezar Mocan and Furkan Üzümcü. Thanks guys, you rock the Marble! Now all of these changes are in a state which is basically ready for release. And even better: Most of the work is binary compatible. Even more important: Some of the features have a social aspect and allow users to easily participate in creation of maps and making Marble a better world to live in. So we want to bring these features to our users as quickly as possible! January 26, 2011: Release of KDE SC 4.6 with Marble 1.0. February 15, 2011: Soft message / feature freeze. March 1st, 2011: Marble 1.1 Beta 1. March 15, 2011: Marble 1.1 RC1. Summer 2011: Release of KDE SC 4.7 with Marble 1.2. Again this development only affects the marble-1.1 branch. 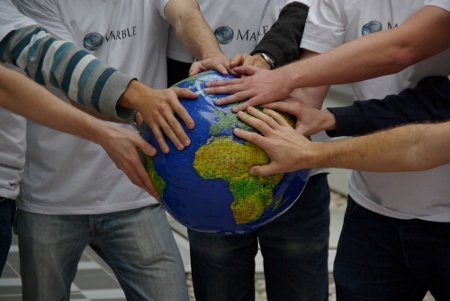 In parallel we'll work on Marble 1.2 which is scheduled to be released together with KDE SC 4.7 in Summer 2011. And again the biggest challenge will be to get Marble 1.1 translated! Lots of helping hands were involved to develop the current version. Would you like to get involved? Please do!.